No. Absolutely not! This is a common misconception. Ask yourself what you are looking for. If the company specializes in "airport transfers" and you need a limousine for your wedding, then that company would not be the best choice. They wouldn't fully understand your needs for a wedding. You want to choose a company that is experienced in the type of occasion you are planning for. This may or may not be true. The prices that are offered to you may not be for the services you expect. Just because one company charges $45 an hour and another charges $85 an hour, does not mean you save $40 an hour by going with the lower price. More often than not you will get what you paid for! Especially with respect to the vehicle itself. A recent model, $100,000 limousine can not be operated profitably at $45 an hour. Be wary! It is always good to pay a little extra and be completely satisfied, than to pay less and be disappointed. Especially for occasions like weddings, when there are no "do overs". Here at Limotions we get it right the first time, every time. Make sure the company has an internet presence (Homepage, Facebook, Twitter) where you can view their actual limousine fleet. Make sure you can view exactly what you are renting. Look at the inside pictures as well as the outside. Some companies use the old bait and switch, and a limousine will pull in at pick up time not looking anything like the one you were promised. Make sure the interiors are not soiled or ripped. Make sure the exteriors are not scratched, chipped and dented. Most of all, make sure the tires are in good conditions and the limousines are CLEAN! Ask for an appointment to visit their office and their fleet to convince yourselves. Serious Limo companies have an office and garages for their Limousines. You are welcome to visit us and convince yourselves! This is very important. You must make sure the company you are hiring is fully insured. It is a considerable expense to a reputable come therefore some limousine operators may not carry adequate or legitimate insurance. A reputable company will not hesitate to provide proof of insurance. Also very important and also a considerable expense to a reputable company. The company must be licensed with the State, County and Airports, and display proper decals on the windshield. If you are pulled over by law enforcement and the limousine is not properly licensed or insured your night, or worse, your wedding day, will be over! It is not worth the risk to use an operator who is cutting corners. A reputable company will have proper licensing and will not hesitate to provide that information to you. If the company you are considering does not have testimonials or references, exercise great caution. Testimonials are of utmost importance. Visit Yelp, TripAdvisor, Facebook and Google+ for testimonials and user experience. One of the best coach builders in the industry is Krystal Coachworks as well as DaBryan. All Krystal limousines are crash tested. They are the only coach builder to crash test their vehicles. They also build more limousines than any other builder in the industry. Quite simply their vehicles are the SAFEST on the road. Their cars all have a 5 year 150 thousand mile warranty. If the company you choose offers "Krystal", chances are you will have the finest and most reliable limousine on the road. 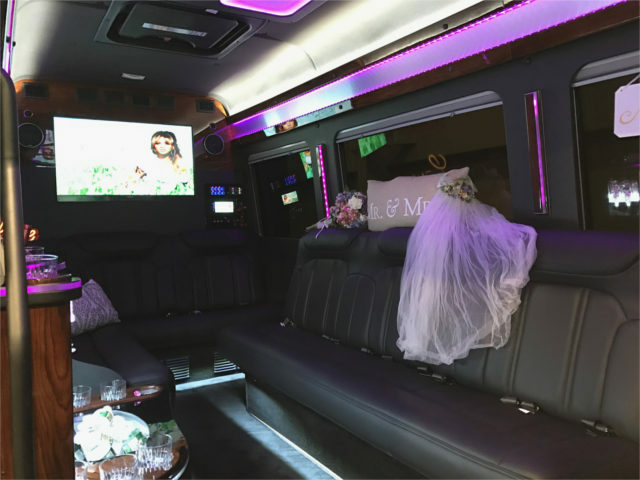 Limotions, Ft. Myers & Naples Limo service proudly provide: of course Ft. Myers Limousine & Ft. Myers Beach Limo and Party Buses, car service Cape Coral and Sanibel, Naples Limousine service and Marco Island. Furthermore, we provide Limousine service and Limo Busses to metropolitan areas like Miami and Ft. Lauderdale and Limousine service to Tampa and Sarasota. But also surrounding areas like Port Charlotte Limo, Sarasota Limousine, Miami Beach and stretch Limo & Party Buses Cape Coral and Punta Gorda car service.